Norm’s Tire Sales, 2167 Long Lak Rd. 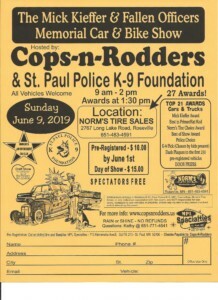 The Mick Kieffer & Fallen Officer's Memorial Car & Bike Show Sunday June 9, 2019, from 9am to 2pm, at Norm's Tire Sales located at 2767 Long Lake Road, Roseville, MN. All vehicles welcome and SPECTATORS ARE FREE! 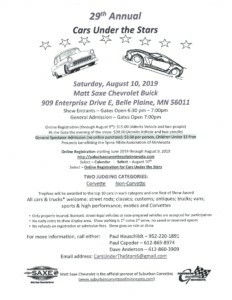 Awards, Dash Plaques, Craft Show and much more! Rain or Shine PRINT FLYER HERE! 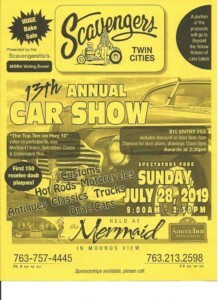 Scavengers Twin Cities 13th Annual Car Show Sunday, July 28, 2019, from 9am to 2:30pm, at the Mermaid Event Center located at 2200 Mounds View Boulevard, Mounds View, Minnesota. SPECTATORS FREE!!! 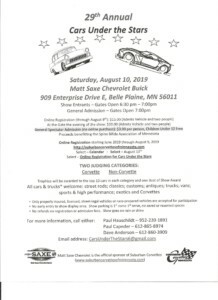 Customs, Hot Rods, Antiques, Classics, Drag Cars, Trucks, Motorcycles and Much, MUCH MORE!!!! THIS IS AN MSRA VOTING EVENT! SEE and PRINT DIRECTIONS HERE!!!! 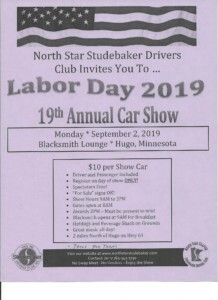 All Cars & Trucks Welcome! Must be insured, licensed, street legal or race prepared. PRINT FLYER HERE!!! 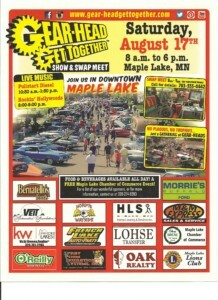 Gear-Head Get Together Car Show and Swap Meet Takes Place Saturday, August 17, 2019, from 8am to 6pm in downtown Maple Lake, MN. 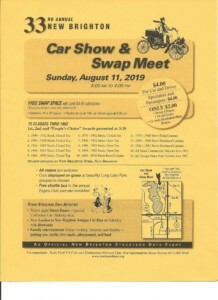 Swap Meet goes from 8am to 5pm (No household items. Call 763-333-4442 for more information. Live Music by Pullstart Diesel from 10:30am to 1:30pm and Rockin Hollywoods from 2:00pm to 5:00pm. No Plaques, No Trophies.......Just a gathering of GEAR-HEADS! WWW.GEAR-HEADGETTOGETHER.COM PRINT FLYER HERE!